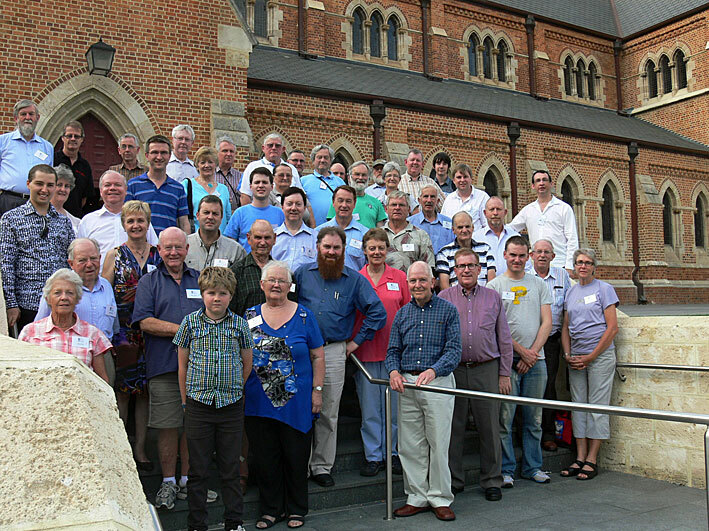 OHTA's 35th annual conference was held in Western Australia from Tuesday 10 to Monday 16 April, immediately after Easter. Starting in Perth, it moved to the southern coast at Albany. The conference included visits to a number of notable organs. Western Australia's boom in mineral wealth has translated to pipe organs, where a number of new instruments or rebuilt instruments have appeared since our previous visit in 2004. These include organs by Létourneau, Pipe Organs WA, the South Island Organ Company and von Beckerath. Major recitals were given by Jonathan Bradley, Patrick Elms, Jacinta Jacovcevic, Joseph Nolan, Dominic Perissinotto and Alessandro Pittorino. There were several lectures relating to organ playing, organ music and organbuilding in Western Australia. 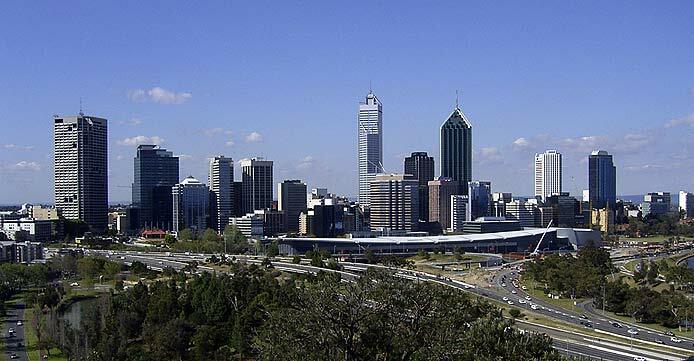 The first day of the conference was spent in central Perth, before moving to Mount Lawley and Mirrabooka. The second day was spent in West Perth, Wembley, Subiaco, Floreat, Cottesloe and ended in Fremantle. The third day was spent in Crawley and central Perth. On the fourth day, several organs were visited in central Perth before we moved on to Albany in the afternoon. The following two days (and three nights) were spent in the Albany region, returning to Perth on the Monday via scenic areas in the south-west. The conference was organised by a local committee chaired by Dominic Perissinotto. OHTA also offered two student bursaries to cover the cost of attendance at the conference (but not inclusive of travel costs to Western Australia). Please click here to download the Conference Brochure for all bookings and information. 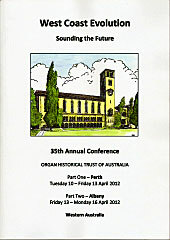 Copies of the 2012 conference book, in A4 format and illustrated, with a total of 94 pages, are available from the Organ Historical Trust of Australia, PO Box 676, Sydney, NSW 2001. The cost per copy is $20.00, inclusive of postage throughout Australia; overseas rates upon application. Cheques for this amount should be made out to the Organ Historical Trust of Australia. inst. 1875. Inst. new cathedral 1888 Robert Cecil Clifton. 2m., 15 sp.st., 3c., tr. Reb. & enl. 1903 J.E. Dodd; reb. 1928 J.E.Dodd (console moved and some ranks completed). Reb. and enl. 1958/59 J.W. Walker & Sons, Ruislip, Middlesex. (1) west end organ: B. 1991-93 Knud Smenge. 3m., 46sp.st., 6c., tr. key action, el.stop action. (2) choir organ, in chancel gallery, B. 1993-94 Knud Smenge. 2m., 18sp.st., 4c., tr. key action, el.stop action. B. 1965 J.W. Walker & Sons., Ruislip, Middlesex. Tonal altns 1978 & c1990 F.J.Larner and Co.
First organ, B. 1895 Bishop & Son, London and Ipswich. Day one commences at St Mary's Cathedral, rebuilt and completed in 2010, home to a three-manual Dodd and two-manual Hobday. We will hear a paper on Dodd's work and recital from Cathedral Organist and Director of Music Jacinta Jakovcevic. Lunch will follow in Mount Lawley (select a café of your own choice). Participants will then visit the W.L. Roberts in Perth College Chapel and Norman & Beard in St Patrick's Anglican Church before heading to John Septimus Roe Community College, Mirrabooka. There you will see the Pipe Organs WA instrument, last seen in skeleton form in the factory at the 2004 Conference, and hear the newly-installed von Beckerath, on which resident organist Jonathan Bradley will give a recital. We return to Perth for the Conference Dinner at Citro Restaurant, at which Dr Bill Loneragan will present a talk on the Organ Society of Western Australia over the past 45 years. This day will visit a number of smaller instruments, commencing with the Kirkham at Trinity College Chapel, East Perth, moving on to a Mack at St Edmunds Anglican Church, Wembley, a Létourneau at St Andrew's Anglican Church, Subiaco, and a Hufner at St Nicholas Anglican Church, Floreat. For lunch you will be able to choose from cafés in the Cottesloe area before seeing a Larner made with parts of the ex-St George's Cathedral 1875 Hill at St Hilda's Anglican Girls School, Mosman Park, and a 19th century organ at St Peter's Anglican Church, East Fremantle. Arriving at Fremantle, there will be a recital on the SIOC instruments at the Basilica of St Patrick by Dominic Perissinotto, Organist and Director of Music. The formal part of the day will end with a visit to the R.C. Clifton organ at St John's Anglican Church. Following the visit to St John's, you will be able to explore the restaurants of Fremantle, returning to Perth at your own leisure. We begin with a restored Dodd, originally from Adelaide, at St Thomas' Catholic Church, Claremont, before moving to the University of Western Australia's Winthrop Hall to hear both a paper on the architecture of the hall as well as a recital on the J.W. Walker & Sons rebuilt by SIOC, featuring two university organ students, Janelle Terpstra (third year) and Alessandro Pittorino (second year). Following a picnic lunch in King's Park, we will go to St George's Anglican Cathedral, Perth, and hear Joseph Nolan, Organist and Director of Music, perform on the Smenge, recently tonally regulated and enlarged by SIOC. Participants will then walk to the Perth Concert Hall to see the Sharp. The day ends with dinner at Miss Maud's Swedish Restaurant. This morning concludes Part One of the conference, visiting the Whitehouse Bros., rebuilt by Bellsham, at the First Church of Christ Scientist, Perth, and the Bellsham at Wesley College Chapel, South Perth, recently rebuilt by POWA. Following lunch at a local café of your own choice, those continuing on to Part Two will take the coach via Albany Highway direct to Albany. That evening we dine at the Dog Rock Motel Lime Restaurant. Today we take in the organs of the Albany region commencing with the Verschueren/Plug in Albany Free Reformed Church, a 1913 Taylor recently installed West Albany Free Reformed Church and Kirkland in Lockyer Uniting Church. We then travel to Whale World, originally a whale-processing factory, stopping along the way to see the Gap and the Natural Bridge. Following lunch at Whale World, we take a tour of the facility, returning to Albany via the Wind Farm to visit the Larner in Scots Uniting Church, Hill & Son in St John the Evangelist Anglican Church and Hufner in Wesley Uniting Church, where Patrick Elms will present a paper on the life of WA organ builder Paul Hufner. Dinner at Nonna's Restaurant will be followed by a recital at Wesley by Patrick Elms, Organist at Scots Uniting Church, Albany, since 1980. The morning is free for participants to attend church services or sightsee at their own leisure. Late morning we travel to see the J.E. Dodd in Denmark Uniting Church, enjoying some more free time in Denmark before heading for a picnic lunch at the house of John Pate, Emeritus Professor of the School of Plant Biology, University of Western Australia. John lives on the top of Mt Shadforth, Denmark, on a 20-hectare property of natural karri forest. To be explored are 5kms of hand cut trails through the natural fauna, together with a magnificent garden and lawn around his cottage. We return to Albany in the late afternoon, in time to dine at Rustlers Steakhouse. We travel back to Perth through the scenic South West region, via the South Coast and South Western Highways. On the way we will visit the Valley of the Giants near Walpole for a guided walking tour and the opportunity to do the Tree Top Walk. We continue on to Pemberton for lunch, driving through karri forest, Manjimup and Bridgetown, before returning to Perth around 7.00 pm.